HARTFORD, Conn. – Soon after Vermont tips off against Florida State on Thursday afternoon, NCAA history will be made. Ernie Duncan, a senior stalwart for the UVM basketball team, will start for the Catamounts. His younger brothers, Everett and Robin, will come off the bench at some point in the first half. Whenever the third Duncan brother plays, it will mark the first time in the 81-year history of the NCAA tournament that three brothers played for the same team in the same game. The Duncans are the mid-major version of the Zeller or the Plumlee families, as they hail from Evansville, Indiana, and they are attempting to rewrite a Hoosiers script in Burlington. "It's really cool," said Brian Speer, who coached them at Harrison High School in Evansville. "I hope they keep playing for as long as possible. I really believe the nation deserves to hear their story." No. 13 Vermont (27-6) plays No. 4 Florida State (27-7) in Hartford on Thursday afternoon, and the Catamounts are hoping to reprise the last time they were an underdog in the NCAA tournament in New England. That came in 2005 when T.J. Sorrentine famously hit a dagger 3-pointer to beat Syracuse in overtime, which Gus Johnson immortalized with his "FROM THE PARKING LOT" call on CBS . Another upset would likely ensure the Duncan Brothers get their own flavor of Ben & Jerry's, the ice cream company headquartered in Burlington. 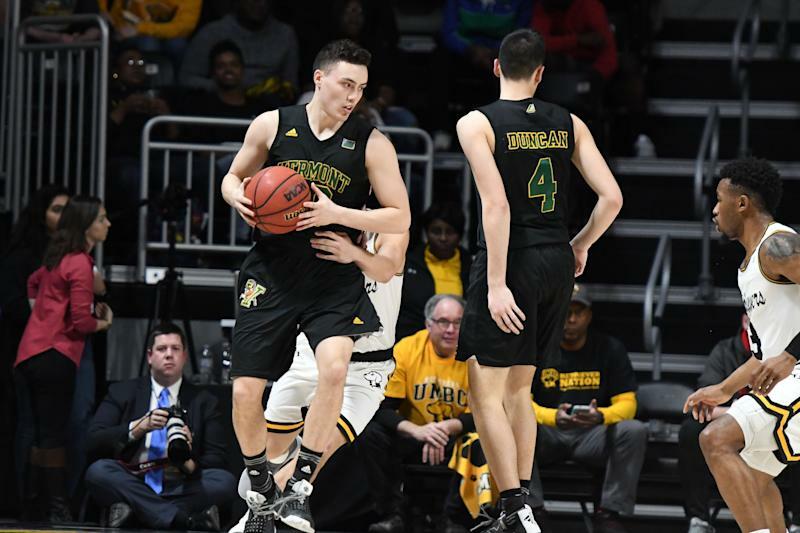 The story of the Duncan Brothers is in many ways the story of Vermont basketball's outsized recent success, which includes three straight America East regular-season championships thanks to putting a premium on evaluation, basketball IQ and development. The Duncans, who are three of Stan and Melinda's six kids, were home-schooled for most of elementary school and junior high and essentially redshirted by their parents. Being older and having more hours in the gym thanks to being home-schooled allowed them to sandwich double sessions of basketball skill work around their schoolwork. "Basketball was our school, in a way," Ernie Duncan said. Stan Duncan showed his kids video of the Steve Nash-era Suns and the Monta Ellis-era Warriors, even taping NBA games over family home videos. There are five boys among the six Duncan siblings, so they'd play three-on-two, although Stan Duncan preferred them doing individual skill work. "My dad was obsessed with the Pete Maravich movie," Ernie Duncan said. "He forced us to watch it because of his work ethic. He'd get his hands on any Pete Maravich drill and copy it." The result ended up being three bedrock players for Vermont's impressive run of success, as the Duncans comprise three of this team's six leading scorers. Coach John Becker has built the Catamounts into what can essentially be considered an Atlantic 10-caliber program in the America East. They've gone 45-3 in the past three conference regular seasons and have a 4-1 record against the A-10. Becker has complemented players like dominant big man Anthony Lamb (21.4 points per game), the America East Player of the Year, with savvy and cerebral players like the Duncan brothers. They've followed through by becoming Maravich drills come to life on Lake Champlain. Ernie, a 24-year-old fifth-year senior, is the big brother and caretaker. He gets teased by his brothers for his receding hairline and was the first Duncan at Harrison High School to hear the chant that echoed through all his brothers' careers: "How old are you? (clap clap, clap clap clap)." Ernie, a 6-foot-3 combo guard is best scorer and player, as he's averaging 13.8 ppg and shot 41.6 percent from 3-point range. Everett, a 23-year-old fourth-year junior, is a glue guy both on and off the floor. He's the family joker, the most outgoing off the floor. Everett, a 6-foot-6 wing, broke Ernie's career-scoring record at Harrison High, but Vermont ended up as his only Division I offer. He even redshirted his sophomore year because of a logjam in front of him. But he's exceeded expectations, averaging 6.3 points and 3.5 rebounds, while simultaneously lifting spirits. "I'm glad this was my only offer," he said. "It worked out for me in the best way." Robin, a 20-year old freshman, is the youngest of the six siblings and a pure point guard. He broke the assist record at Harrison High, and jokes that his own shooting struggles stem from a childhood spent as Ernie's permanent rebounder. A back injury to Ernie forced a redshirt his first year on campus and enabled all three brothers to play together. The Duncan family and Speer will all travel up to see the brothers play on Thursday. "It's like a dream," Robin said. The family ties to Vermont can be attributed to Ernie Duncan's mature evaluation of his basketball reality. Ernie Duncan was considered a basketball prodigy entering high school. Before he'd ever played a game, Tom Crean watched him work out at the school. Ernie and Everett even visited with then-Butler coach Brad Stevens around the same time. By the time he became an upperclassman, the high-major interest had cooled as he wasn't that caliber an athlete. Instead of waiting for the biggest name, he searched for the best place. Vermont associate head coach Kyle Cieplicki, who recruited all three brothers, stressed to Ernie Duncan what a priority he'd be, texted him more than any coach and sold him on the school's winning tradition. "Where's the best chance to get to the tournament?" Ernie Duncan said. "Where's the best place I can play and start and do all the things I want to do? This place came out, it was a no-brainer for me." Crean told Yahoo Sports: "Give Ernie credit. He found something he liked and jumped on it." And it soon became a family tradition, which on Thursday will be NCAA history. "The way it's worked out has been unbelievable," Cieplicki said. "We thought Ernie was as high-level a kid as we've gotten. We were excited about that, and it's all worked out perfectly from there."